Thread: Look for Lombax writing! As I've proven in this topic (warning, it's in French), there do in fact exist official Lombax signs for the letters K and X (also in my new sig). Since these come from observation, there could or could not be usage of J and Z in the series. Capture any Lombax writing you spot throughout the games and comic, and attempt to translate them in hope of spotting unusual symbols that could be J or Z.
I think there's a purple sign with Lombax writing in Luminopolis but I haven't been able to get a proper picture of it. Also, I don't have the comic books either. Yea, and the official font has the two still missing letters as well (and numbers from 0 to 9). The guy out there who made that Lombax Scrabble asked IG to send the complete alphabet to him so he could use it. IG didn't have it as a font and the letters were just pictures, and they sent the pictures to the guy in exchange for that he makes a real font out of them and sends it back to IG. That's why the guy's name is in ACiT credits as well, for compiling the letter pictures into a font. Should we ask IG to get the official Lombax font released or wait for the last letters to appear in the series so it could be made by the community? We could also check if the pictures of the Scrabble tiles have unknown letters: they must be either J or Z. You could also check the numbers by comparing the pieces to normal Scrabble tiles. Though Grzelak has blacked out the missing letters, you could check out the other pictures of the tiles. What are the symbols in the corners of the tiles supposed to be? And what's the symbol on the bottom-right-most tile in this set supposed to be? Those small symbols represent numbers, which tell how many points you get for using the tile in question. I guess the letters have the English values (why they wouldn't? ), so the symbols can be directly compared to the numbers in normal English Scrabble tiles. 5 in K (a single cog with eight "teeth"
Oh, I see. Interesting. If only we could get clearer images of them. Is 5 supposed to be the same as B? And is 1 just A rotated and with the gaps filled in? 1 is that, but 5 has narrower teeth than B, like the PS3 R&C themes' symbols that represent cogs. I've passed on this info to the French RG. In the meantime, anyone find Lombax in the comics? Also, that purple sign in Luminopolis isn't Lombax. I know. That's where I found the X. There are lombax in ACIT! in Axiom city! theres a sign with soem yellow lombax letters! i check it now! EDIT: there are a new form for letters in the comic! especially the Vartax sign! and the already translated it! But is looks hard to make as a font! maybe someone should scan it and then zoom on the symbols! Wait…. i'm on it! There's more than a gallery there! EDIT: i don't know if there are lombax writing at fastoon but it should be! I was on axiom city and looked on the sign! and there seems like it is a new character ther! but maybe not too! i don't have time to translate the sign but i think it's a new letter! It's the L just turned around! Is this the sign you mean? Good find, but I think it's literally L backwards, because the smaller text says "angel", and the big text is just the same word, in reverse. Otherwise we'd also have a backwards G and N, which makes three unknown letters and we just need two. Yes it is! but if it stays "angel" and it stays "angel" on Aphelion! there must be a connection! It's probably a coincidence and they just picked "angel" as a random word for attraction. But it is odd that Lombax writing would be seen on Terachnos of all places. there are a new form for letters in the comic! especially the Vartax sign! and the already translated it! But is looks hard to make as a font! 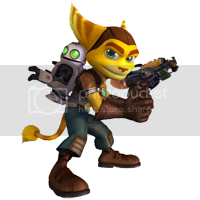 I saw that font in Qwark's ship too, it said Helios Project as it was translated by Clank, what doesn't make sence to me, is this: http://en.ratchet-galaxy.com/images/comic/preview/6_en.jpg Why is it translated like that there? That font also made it into a SPEECH BUBBLE! When everyone was asking Qwark questions about him running for president, one of them asked a question that was not translated, I find it strange this was in a speech bubble, and not translated?